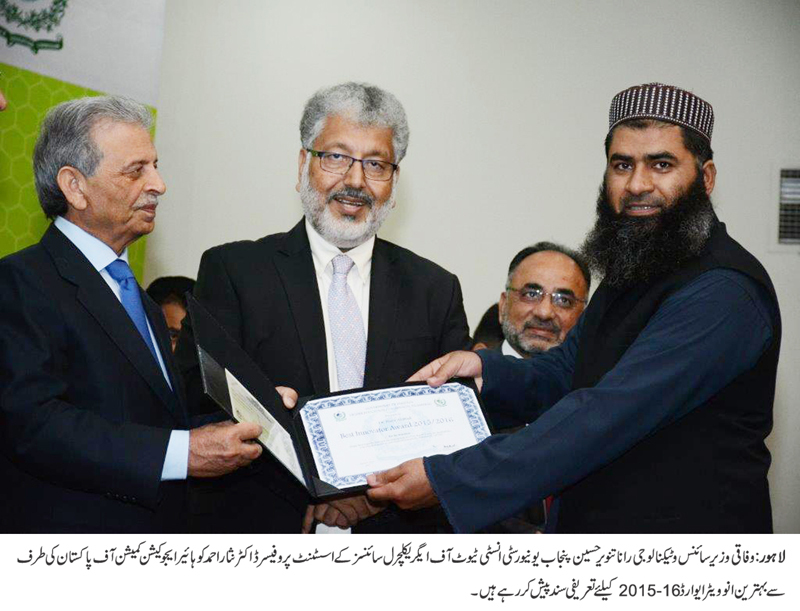 LAHORE: (Thursday, March 8, 2018): The Higher Education Commission of Pakistan has granted the Best Innovator Award 2015/2016 to Punjab University Institute of Agricultural Sciences Assistant Professor Dr Nasir Ahmad. 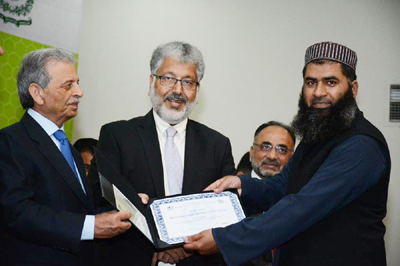 The award was conferred upon him during 6th HEC Outstanding Research Awards ceremony held at HEC, Islamabad in which Federal Minister for Science & Technology Rana Tanveer Hassain was the chief guest. The Chairman HEC Dr Mukhtar Ahmed, Executive Director Dr Arshad Ali, Advisor Research & Development Dr Muhammad Latif and a large number of Vice Chancellors and researchers were present on the occasion. PU Vice Chancellor Prof Dr Muhammad Zakria Zakar, Ph.D. supervisors, co-authors Prof Dr Muhammad Saleem Haider and Prof Dr Naeem Rashid congratulated to Dr Nasir Ahmad on his outstanding achievement.